Corporate contribution to the community has come a long way over the years – from one-off charity giving to more business/corporate philanthropy, and to some extent, a more strategic focus with an emphasis on selected partnerships with Civil Society Organizations/NGOs. The number of ways companies have practiced their giving to the community has increased as has the amount allocated through their Corporate Social Investments and Corporate Social Responsibility programs. This journey is an important one to understand, especially for local civil society organizations keen to diversify their resources and partner with the private sector to enable them to achieve their mission. Corporate giving towards development and humanitarian assistance has become increasingly important and consequently moved up the agenda in many companies operating in Kenya both multinational, Small and Medium Enterprises. As shown in this study, companies support causes in health, education, environmental conservation, poverty reduction and humanitarian emergencies among others. The growing private sector giving has therefore attracted the attention of development agencies including civil society organizations particularly against a backdrop of economic downturn and shrinking donor support. This is viewed as a sustainable alternative to bridge the financial gap to meet increasing needs for responding to development work and humanitarian aid. However, the Civil Society Organizations (CSOs) engagement with the private sector is fairly new. Additionally, the two sectors have for a long time been perceived to have an ambivalent relationship occasioned by assumed lack of similar values or mutual interest in sustainable development, limited trust, and perceived CSOs limited capacity and expertise to effectively engage with the business sector. The rift is further deepened by limited information and understanding on how each sector engages in community development that has as a result hindered strategic partnerships. As part of strengthening CSOs in Kenya, the Aga Khan Foundation and United States Agency for International Development (USAID) are partnering in implementing a project, the 'Yetu Initiative' which seeks to build a "Community of Practice" in which CSOs strengthen their assets and capacity. The initiative is envisaged to build trust necessary to cultivate a culture of community philanthropy as well as enhance proactive civic engagement in addressing community needs. 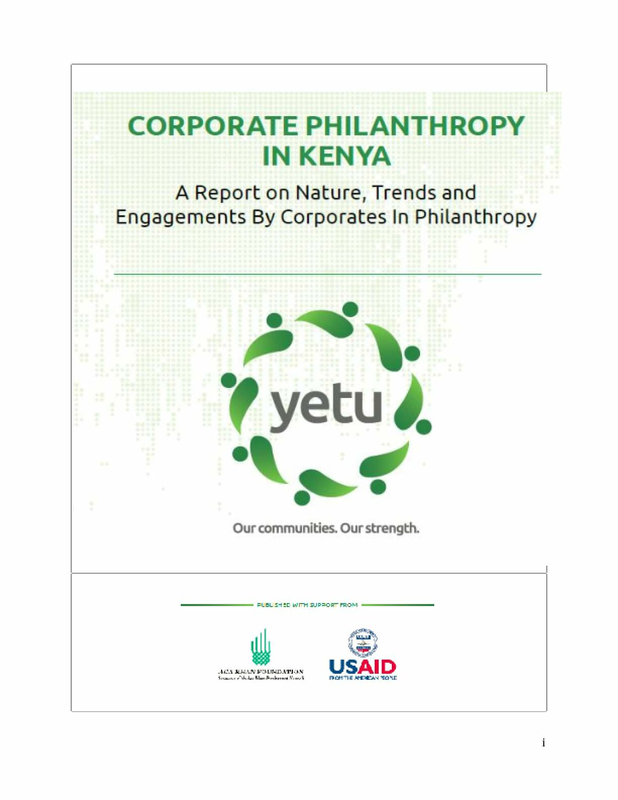 This report presents information on motivation to private sector giving, nature, and trends with special focus on corporate philanthropy in Kenya. It maps out players in corporate philanthropy in Kenya, outline key drivers and deterrents of corporate philanthropy to CSOs in Kenya, and assesses the processes and criteria employed by the private sector for corporate philanthropy. A cross-sectional research approach informed the study design in which qualitative and quantitative techniques were integrated to capture information from a sample of 60 companies operating in Kenya. The sector distribution of companies was as follows: Manufacturing (17%), Transport & Storage (13%), Money, Banking & Finance (13%), Tourism (12%), ICT (12%), Agriculture & Agro-processing (10%), Commercial Services & Retailers (10%), Environment & Natural Resources (7%), Energy (5%), and Building and Construction (2%). Copyright 2017 by The Aga Khan Foundation. All rights reserved.